The Federal Reserve FOMC statement, after the two day meeting which ended yesterday, has left a clear impression on the market that we are moving ever closer to an interest rate rise in the US. Subtle changes in the wording of the statement from the previous one, such as talking about the possibility of raising rates at the next meeting (which takes place in December) instead of the less explicit mention of “how long to maintain” the status quo, and removing a previous reference to global economic and financial developments possibly restraining economic activity, have excited market participants. 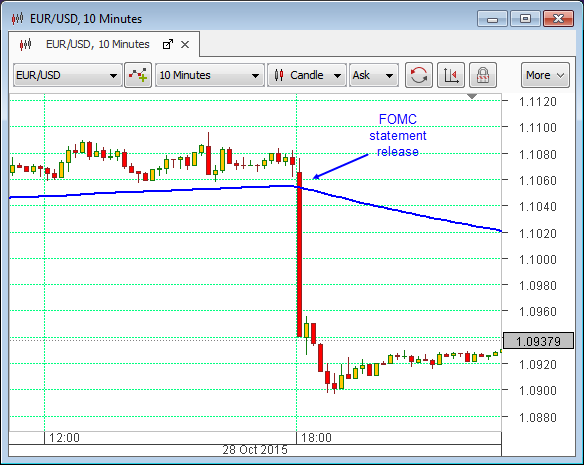 Despite the fact that the Forex market bought the US dollar across the board in the immediate aftermath of the statement (see chart above for EURUSD – a drop in this pair indicates a strengthening dollar), indicating that it sees it as strongly hawkish, the Fed is still reiterating that two things remain essential for an actual rate rise to happen: job growth and utilisation (the proportion of unemployed people who are actively seeking work) have to improve further, and inflation has to be seen to be moving towards the 2% annual level that the Fed wants. So indicators of these will be even more closely watched in the coming months and weeks. Today will see the release of the latest US Initial Jobless Claims and US preliminary GDP figures, which contribute to exactly the economic trends the Fed is watching. They will both be released at the start of the US trading session. They will either confirm the recent bias of the Forex market or throw some confusion into the consideration of whether a rate rise is still on the cards for 2015. Today also sees the numbers for the German Harmonised Index of Consumer Prices (inflation) and this could create an additional impact on the Euro-dollar exchange rate. Any further weakening in German inflation is bound to strengthen the expectation that more ECB easing is in prospect, which is also calculated to weaken EURUSD. Exciting times.